Arrector pili muscles are just one of the structures of or associated with hair follicles. Arrector pili muscles are the tiny muscles between individual hair follicles and an adjacent region of the outer-part of the dermis layer of the skin. The arrector pili muscle associated with each hair follicle extends from the side of the hair follicle to the outermost (i.e. towards the surface of the skin) part of the dermis layer of the skin. 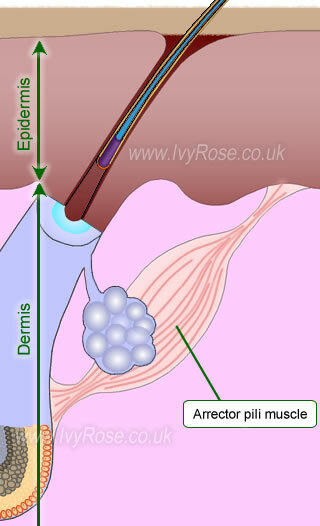 The arrector pili muscles associated with hair follicles consist of smooth muscle (i.e. these muscles are under unconscious, rather than conscious control). When at rest, the arrector pili muscle is extended and the hair shaft emerges from the skin at a shallow angle. When the body is under some form of stress, e.g. due to fear or low temperatures, the nerve endings (of the autonomic nervous system) stimulate the arrector pili muscles to contract, which in turn pulls the bulb of the hair follicle towards the end of the arrector pili muscle that is attached to a position within the upper-part of the dermis layer of the skin. 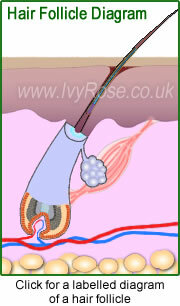 Therefore the hair shaft emerges from the surface of the skin at closer to 90o, i.e. perpendicular to the surface of the skin. This also results in slight elevations of skin where each hair shaft emerges - elecations which are colloquially referred to as "goose pimples" (British English) or "goose bumps" (American English). Arrector pili muscles are just one of many structures of or associated with hair follicles. See also the links to pages about other accessory structures of the skin.